It's been a few months since I last shared the wonderful nuggets of British TV I've managed to dig up from old VHS tapes, but rest assured I've still been busy with this curious past time. 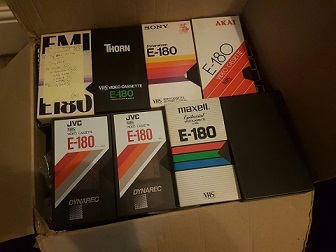 I've received a couple of donations in that time and I even took a punt on some I saw for sale online - the cases looked pretty old and it turned out they had recordings go back to 1983, so paying out for a pile of unknown tapes does occasionally harvest something interesting. So, without further delay, here's some of the more interesting finds I've captured! Perhaps one of the oddest TV shows I've found, Murun Buchstansangur is an incredibly offbeat animation featuring a grey 'thing' who leads the most peculiar life in amongst the dirt down a crack in a kitchen. Not only is it a fairly grim existence for old Murun, but he also has to endure a stream of existential crises and all round inability to engage with the world in any manner which comes close to being described as normal. This episode comes from the first series, but is from an early 90s repeat. Long before Clarkson (and decades before Matt LeBlanc) hosted Top Gear we had presenters such as William Woollard and Chris Goffey hosting the motoring show. And this episode (missing the opening titles) demonstrates exactly how different a show it was well over 30 years ago. Easily the best piece of 'unseen for years' piece of television I've captured, Hidden Talents was part of the 1986 anthology series Unnatural Causes and was the final role that Pat Phoenix played before her untimely death. Written by Lynda La Plante, it's a fantastic play and a more detailed look at the show can be found over at my blog article on it. Everyone loves Sue Robbie and her quiz show from the mid-80s is well remembered by everyone who watched it, so I was as pleased as punch to uncover a full episode of the series. And, to add an extra sheen of delight, Charles Foster provided the Granada in-vision continuity leading up to the episode's start AND the great man provided narration in the actual episode. I love 1980s football and, tagged onto the start of a recording of a Jasper Carrott compilation show, I found the very end of that evenings Match of the Day which just happened to feature December 1984's goal of the month competition (my money's on Charlie Nicholas). There's also time for a quick word from Don Howe. For a certain generation, Philip Schofield appearing in The Broom Cupboard conjures up the most nostalgic memories of being carefree and able to be at home watching TV way before 5.30pm (as most adults are forced into by their pesky jobs). I've found a few clips of Andy Crane previously, but never any Schofield UNTIL NOW and, hopefully, I'll find more in the future. In fact, I did actually find 1/4 of a second of Schofield in the Broom Cupboard earlier this month on a different tape, but it was far too short to even bother getting a screenshot of. Even more 1980s football coverage and, this time, it comes from a chunk of Grandstand that I recently found at the end of a VHS tape. We're treated to a lengthy chat between Trevor Brooking (he wasn't a Sir back then, just a regular fella) and the legendary Bob Wilson before we see a feature on Clive Allen (with out of this world 80s jumpers) and footage from the Scottish Skol Cup final. From the same tape as the Grandstand footage, I also unearthed the last 9 minutes of an episode of Saturday Superstore which included not only a fully clothed Keith Chegwin, but also a phone in section with a young Bob Geldof. Some great finds indeed and I am, as ever, still itching to get hold of any tapes from the early to mid 80s that you've got sitting about collecting dust, so please get in touch! And if you've got VHS tapes from the 70s, you MUST get in touch immediately! Charles Foster, currently the voice of daytime reality series Judge Rinder. Ben, you might like to check out a 1986 drama called Fighting Back which is currently up on YouTube. It's never been repeated, and it's a gritty little gem of a social realist drama starring Hazel O'Connor and Derek 'Charlie from Casualty' Thompson. Good quality uploads of all 5 eps. Thanks for the tip-off, Mark! I'll try to start watching that when my baby is asleep - may be a while!